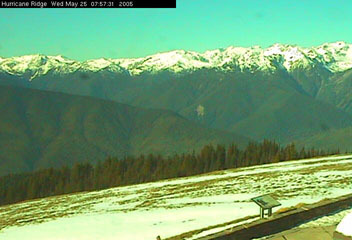 Ever since they put a web camera on Hurricane Ridge in Olympic National Park, we've been watching the images. Most of them are pretty boring, if you consider spectacular mountain scenery boring. 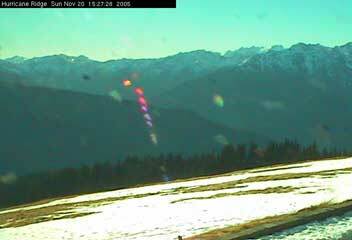 January 16, 2008 - It has been cloudy lately, particularly up on Hurricane Ridge, but this evening, the clouds blew away and the park webcam managed to catch a rather spectacular sunset. To watch the movie, you must have Quicktime. November 20, 2005 - The sun doesn't get very high in the sky this time of year, so we get to see a really neat lens flare in the afternoon. The air at sea level is awful and foggy. There is an air stagnation alert down near sea level, but it looks pretty clear up at the ridge. 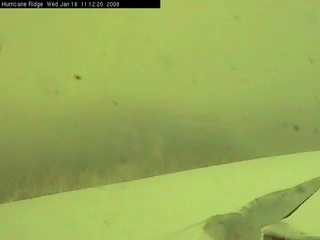 November 20, 2005 - This isn't really a Hurricane Ridge movie. 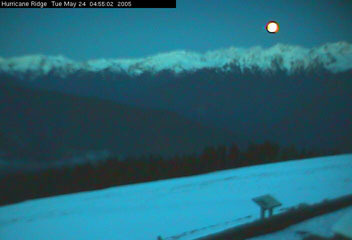 It uses images from the Lake Crescent web camera. 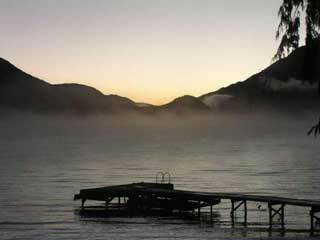 The air might be a bit thick and foul down at sea level, but 600 feet up, at Lake Crescent, it is warmer and clearer. The day light is really beautiful this time of year. Download the movie. It is short. There isn't much day light this time of year at this latitude. 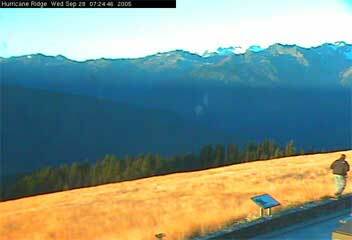 September 28, 2005 - The grass has turned golden, and the morning mountain shadows sweep the valleys. Dawn is always an interesting time for light and mountains. It seems like the lone visitor missed the most dramatic part of the show. May 24, 2005 - This is a serendipity. The moon set shortly before dawn. You can see it disappear behind the mountains, and then you can watch the sun rise. The web camera automatically adjusts the light level, so the moonlit area has a bluish cast, but the rosy cast of dawn is unmistakable. May 25, 2004 - This was a warm day. All of the snow at the Ridge had melted some time ago, but there had been an additional seven inches. This snow lasted for a while, but when the sun came out, the snow melted rapidly. Keep your eye on the green patches, and watch them grow.